Dental care is as important for pets as it is for people. In fact, it’s estimated that almost 90% of all adult cats and dogs suffer from periodontal disease to some extent. Brushing your pet’s teeth may be difficult to add to your list of daily chores, but keeping his or her teeth and gums healthy is essential for a long, healthy life. Make caring for your pet’s teeth easier with VetriScience Perio Support, an easy-to-use dental cleaning powder for cats and dogs that helps reduce plaque and promote healthier teeth and gums. What are the signs of dental disease in dogs and cats? Bad breath – While it’s true that bad pet breath can come from a variety of sources, continuous mouth odor can be a symptom of decaying teeth, plaque buildup, and periodontal disease. Puffy, red and/or bleeding gums – Gum disease (also known as gingivitis) can result in inflammation, redness, and bleeding. There can also be separation of the gumline from the teeth, which can become infected and painful. Increased drooling – Excessive salivation is a key indicator of oral disease, but can also indicate other health problems such as heatstroke, contact with poisonous plants, anxiety, or upper respiratory infection. Yellow or brown spots on teeth near the gumline – Plaque and tartar buildup can become visible as discoloration of the teeth, leading to tooth decay that may require professional dental cleaning, drilling and filling, or even tooth extraction. Difficulty eating – When teeth or gums become infected, painful abscesses may result. If your pet has oral pain, he or she may refuse to eat, which can result in weight loss and malnourishment. If your pet displays any of the above symptoms, consult with your veterinarian. A veterinary dental examination may be required for further evaluation. Daily brushing of teeth and gums is widely recommended by veterinarians as the #1 way to prevent dental disease in dogs and cats. There are now specially designed pet toothbrushes made to fit your pet’s mouth perfectly, as well as pet toothpaste in flavors cats and dogs love. These help make brushing your pet’s teeth easier. Toothpaste for humans is not safe for pets, so be sure to use only toothpaste that is formulated specifically for cats and dogs. Brushing your pet’s teeth every day may not be easy to fit into your busy schedule. Luckily, there are more products than ever to help remove plaque and tartar from your pet’s teeth between brushings. These options are ideal for those pet parents who are only able to brush their pets’ teeth a few times per week. Dental treats and chews are a popular way to give pets a tasty snack that has the added benefit of promoting oral hygiene and fresher breath. Your pet’s natural chewing action helps scrub plaque and tartar from the teeth and gums, while special ingredients help safely reduce bacteria that cause tooth decay, gum disease, and bad breath. Another easy way to help keep your pet’s teeth clean and breath fresh is by using a dental rinse or water additive to kill bacteria that cause plaque and tartar. Water additives like Be Fresh Dental Care Solution can easily be mixed with your pet’s daily water to whiten teeth, freshen breath and kill harmful bacteria that can cause dental disease. Develop your own comprehensive pet dental care program to include regular brushing along with a combination of other dental care products, as well as veterinary dental visits once or twice yearly to help protect your dog or cat against dental disease. 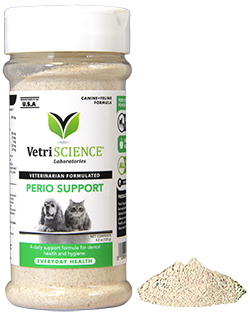 VetriScience Perio Support is a convenient and effective powder for cats and dogs that safely helps remove plaque and tartar between brushings. Just sprinkle a small amount over your pet’s daily meal for a cleaner, healthier mouth. Natural zeolite microporous minerals in VetriScience Perio Support penetrate and remove plaque that clings to your pet’s teeth, while the proprietary blend of powerful prebiotics such as L. acidophilus, E. faecium, B. subtilis, L. casei, L. fermentum, and L. planterum helps to improve overall oral health and freshens breath. VetriScience Perio Support is the perfect second line of defense against plaque, tartar, and bacteria when used in conjunction with regular brushing to keep your pet’s teeth strong, healthy, and pearly white. The bottle comes with a convenient dual-sided lid with a sprinkle shaker on one side and a wide teaspoon-accessible opening on the other. Promote healthier teeth and gums in your dog or cat daily with the help of VetriScience Perio Support dental powder, even on days when brushing isn’t an option. Win FREE VetriScience Perio Support! 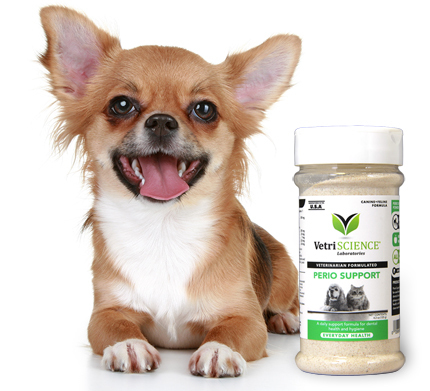 Does your dog or cat need VetriScience Perio Support? Just leave a comment below and you could win FREE VetriScience Perio Support from 1800PetMeds! One winner will be chosen at random on Wednesday, November 1, 2017, so everyone who participates has a chance to win! (Limited to residents of the U.S.) Good luck! Congrats to the drawing winner, Bruce E. Look for an email from us regarding claiming your prize. [Giveaway] Even your pet can go green on Earth Day! ← How do cats know how to use a litter box? This would be great for my dog that hates to have his teeth brushed. Thank you 1-800-PetMeds for making Sunshine’s day today! We received the prize winning VetriScience Perio Support powder along with a Max doggie toy and the usual milkbone in the box. Sunshine was excited to see his box arrive via FedEx and could not wait for me to open it. He absolutely loves his new toy and we put the VetriScience Perio Support on his food as directed, he gobbled up all his food without a break! I think he really likes it!